Extreame Savings Item! 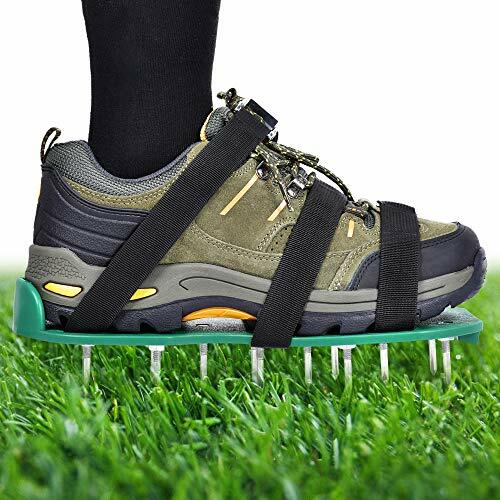 Save 46% on the Nosiva Lawn Aerator Shoes - Lawn Aerator Spike Shoes Heavy Duty Spiked Sandals with Zinc Alloy Buckles 2'' Spikes One Size Fits All 8 Adjustable Nylon Straps for Aerating Your Lawn or Yard by Nosiva at The Mirror Project. MPN: NO-LA-001. Hurry! Limited time offer. Offer valid only while supplies last. 8 ADJUSTABLE STRAPS WITH DURABLE BUCKLES - This lawn aerator shoes come with 6 adjustable nylon straps, durable zinc alloy buckles and 2 extra straps to replace. Zinc alloy buckles are highly anti-corrosive, buckles serrated design and nylon belt with the convex point to prevent shoes slip around on your feet. The nylon straps are wear-resistant, which are more durable, solid and last longer. PROMOTES GREENER, HEALTHIER LAWNS - Nosiva Lawn aerator shoes let air, water and fertilizer to reach grass roots more easily, which helps the roots grow deeper, adding vigor and thickness to your lawn, improving the health of your lawn. The ergonomic design ensures that the shoes stay tightly on your feet, using the correct method, the sharp nails make it easy to dig the soil for effective aeration. You will keep your yard looking impressive and well-maintained all summer long. ONE MINUTE ASSEMBLY - 26 2" heavy duty spikes have been installed by professionals during manufacture. Removing the unsafe risks of your own installation and ensuring that each nail will not lose. Saving your time and putting lawn aerator shoes into use quickly. Tested to prove that you can install six straps on a pair of lawn aerator shoes in a minute. It is the quickest and easiest way to aerate your garden! ONE SIZE FITS ALL - Nosiva lawn aerator shoes are one size, but adjustable straps fit all adult male or female shoe sizes. Simply adjust the length of straps through the buckles. Once you have determined the desired length of straps, secure the excess length of straps by either tucking them into your lawn aerator shoes or by cutting off the excess straps. If you cut off the excess straps, we recommend leaving 2 inches excess straps. ECONOMIC AND CONVENIENT- Lawn aerator shoes are cheaper than an aerator machine rental and easier than using a hand lawn aerator! Simply wear Nosiva lawn aerator spike shoes, maintaining your lawn at a professional level is as easy as taking a walk. You use weight of your body to push the spikes into the soil as you walk, making for a carefree experience. Now you won't have to carry a heavy tool around your yard to aerate. If you have any questions about this product by Nosiva, contact us by completing and submitting the form below. If you are looking for a specif part number, please include it with your message.